The complex healthcare needs of pregnant patients, where care is tailored to not one but two patients, pose specific challenges to anesthesiologists. This book provides concise, case-based discussion on the clinical scenarios and challenges faced in the provision of anesthesia and pain relief for expectant mothers. In the style of problem-based learning, each case is presented as a short scenario, followed by discussion of the causes, risk factors, management and controversies involved. The textbook features a wide range of cases, from common clinical scenarios that are experienced in day-to-day practice to the rare but significant pathologies less familiar to most clinicians. With a global base of contributors, the book is relevant to practice across the world. 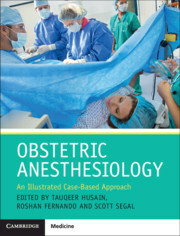 The concise format supports both trainee anesthesiologists in their initial experiences of obstetrics and exam preparation, and experienced clinicians in need of a reliable, quick-reference text. Dedication; List of contributors; 1. Eating and drinking in labor: risks versus benefits; 2. Epidural analgesia maintenance; 3. Breakthrough pain after labor epidural analgesia; 4. Epidural analgesia and intrapartum fever; 5. Tips and tricks for labor neuraxial block; 6. Spinal ultrasound use for neuraxial anesthesia placement; 7. Combined spinal-epidural anesthesia/analgesia; 8. Non-pharmacologic analgesia for childbirth; 9. Systemic pharmacological analgesia; 10. Consent considerations in maternity: Part A: a US perspective; Part B: a UK perspective; 11. Accidental dural puncture; 12. Fetal heart rate monitoring for the obstetrical anesthesiologist; 13. Multi-disciplinary team management; 14. Obstetric early warning systems; 15. Obesity in pregnancy; 16. Complex adult congenital heart disease in pregnancy; 17. Hematological disorders in pregnancy: preoperative bleeding problems; 18. Respiratory disorders of pregnancy; 19. Liver disorders in pregnancy; 20. Neurologic disorders in pregnancy; 21. Abnormal placentation; 22. The role of transthoracic echocardiography in hypertensive disorders of pregnancy; 23. Elective caesarean delivery; 24. Emergency delivery for fetal distress; 25. Uterotonic use; 26. Postpartum sterilization / tubal ligation; 27. Non-delivery procedures; 28. Preterm labor; 29. Accidental awareness during general anesthesia in obstetrics; 30. Failed epidural top up for caesarean delivery; 31. Maternal hypotension after neuraxial anaesthesia; 32. Management of an anticipated and unanticipated difficult airway in the pregnant patient; 33. Major obstetric haemorrhage and point of care testing; 34. Cell salvage for caesarean delivery with high risk of haemorrhage; 35. Emergency hysterectomy; 36. Interventional radiology; 37. Amniotic fluid embolism; 38. Local anesthetic toxicity; 39. Medicolegal issues; 40. Chronic pain after pregnancy; 41. Neurologic deficits following a primary elective caesarean delivery under spinal anaesthesia; 42. Management of post-dural puncture headache; 43. Non-obstetric surgery during pregnancy; 44. Trauma in pregnancy; 45. Ischaemic heart disease and myocardial infarction in pregnancy; 46. Intracranial lesions in pregnancy; 47. Sepsis in obstetrics; 48. Management of thromboembolic phenomenon in pregnancy; 49. Pandemic flu; Appendix: reference ranges in pregnancy; Index. Tauqeer Husain is a Consultant Anaesthetist in the Department of Anaesthesia, Ashford and St Peter's NHS Foundation Trust, Surrey, where he specialises in anaesthesia and analgesia for childbirth. Roshan Fernando leads Clinical Obstetric Anaesthesia Research at the Department of Anesthesiology and Perioperative Medicine, Women's Wellness and Research Centre, Hamad Medical Corporation, Qatar, where he also jointly coordinates a fellowship training program. Scott Segal is the Thomas H. Irving Professor and Chair of the Department of Anesthesiology in the School of Medicine, Wake Forest University, North Carolina. His research interests include epidural-associated intrapartum fever and its effect on the fetus.